Reliving the past – four times over! 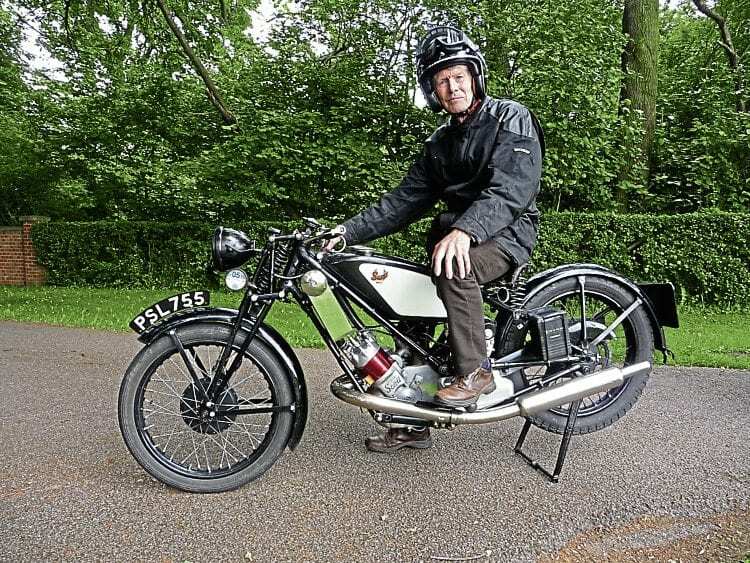 Perran Newman hadn’t swung a leg over a motorcycle in more than 20 years when a friend invited him to try four of his vintage machines along with a modern BMW for comparison – and here he recounts the experience. Then a rare opportunity comes my way. My last bike rides were with Tony, both of us on 350cc BSA B31s. He now tells me he has a few vintage bikes and that I’m welcome to come and try riding some of them. My feelings about this are agonising. Is it a last chance before saying farewell to bikes forever? Am I even capable of rising to the challenge? Besides, there is the issue of sheer physical strength, for I’ve developed peripheral neuropathy, which means that my feet do not give me the feedback they should. I’m not entirely sure where they are and what they are feeling. Tony’s 1930 600cc Scott Flying Squirrel was the third vintage motorcycle that Perran tried out – and with its low centre of gravity, free-revving engine and sound to match, it was a delight to ride. These issues will probably get worse, so I decide in a moment of intense clarity that it’s now or never, and we arrange a date for my visit – two days of riding bikes again! The weather is good in early June and, having bought a new helmet (the mice made a nest in the old one) and with the Belstaff wiped down, I arrive at Tony’s house and there on the drive, acting as a signpost, is his green B31, a rigid model from 1949. The adventure is about to begin and my confidence is soaring as I sit astride the machine and everything seems familiar and safe. Tony chooses to ride a 1930 Sunbeam Model 9, a 500cc ohv machine with hand gear change, and we set off for a local market town. There we can command the square with our presence while eating, drinking and reminiscing. We seem to attract attention from young and old alike, and pictures are requested and taken. I must briefly mention that the B31 kick start return spring had failed during Tony’s earlier shakedown of the bikes, so a bump start is necessary in front of the onlookers. I sit aboard and Tony pushes me off – how different from when I was 18 and I could do this myself with a short run and a jump into the saddle. Read more and view more images in the August 2018 issue of OBM – on sale now!